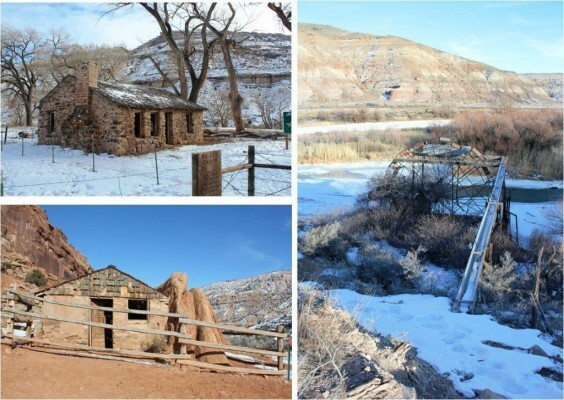 These three Homesteading Sites of Escalante Canyon are all unique to the canyon area, not only for their manner of construction, but for the historical elements attached to them. All three of the following resources present themselves as community resources in which local citizens can relate to their history. Located on the Captain Smith’s Cabin property are two cabins in fair condition, as well as a root cellar. Built in 1911, the main cabin is a one-story, one-room building with stone walls. Captain Smith chose a huge fin of rock for site of his cabin, half of it buried in talus. The slab of rock makes up the fourth wall of the main cabin. Smith dug out a level floor, and squared up stones for the three other walls. A tombstone cutter by trade, he carved niches for his guns and used rock shelves as his bed. The construction is very unique to Escalante Canyon, which is known more for its traditional log cabin construction than carved sandstone structures. Because his cabin was so small, Smith built a “bunkhouse” for his guests; for many years the guest cabin provided a welcome stopover for those traveling in this remote area. Unfortunately, vandalism and deterioration have increased. Major cracks in the exterior wall continue to expand, the doors and windows are missing, the interior walls have begun to crumble, leaving piles of rubble, and the cedar roof needs to be replaced. The Walker Stone Cabin was built by homesteader Harry Walker and his sons in 1911. The stone cottage is modest at about 30’ x 27’. Constructed out of stone the cabin consists of a single-story, double-pile, side-gable house in the American folk or vernacular tradition. Walker and his four sons came to the area in two covered wagons, long after pioneering by prairie schooner was passé, and when railroads were the typical mode of transportation. Until the sons built stone cabins of their own, as many as eleven Walker children and grandchildren lived in the cabin; in addition, one room was usually occupied by the Escalante Canyon rural school teacher. The stone-mortared cottage is significant because it possesses work done by a mason, and is not a typical homestead built in the canyon. Virtually intact, the Walker Cabin and the two buildings located on the Smith property are the only buildings within the canyon known to survive from the period. The Walker Homestead has experienced severe vandalism over the years. Large stones from the fireplace have been removed, the kitchen cupboards and shelves have been destroyed, and the interior and exterior doors and windows no longer exist. There are large settling cracks visible in the walls and the cedar shingle roof has deteriorated allowing leakage to damage the interior plaster. The Waterwheel is constructed out of steel and has 30 buckets that have the capacity to deliver one cubic foot of water to irrigated fields of crops. It was built in approximately 1933 to be used during high water. It may be the only water wheel left on the Gunnison River, built by Nelson J. Heater, date unknown, the current waterwheel replaces a wooden water wheel that is assumed to have been built around 1911. The waterwheel is representative of the early farming history of the Delta County pioneers using irrigation water directly from the Gunnison River and the ingenuity that it took to develop it. Due to lack of maintenance natural deterioration is taking a toll on this structure. The Homesteading Sites of Escalante Canyon have experienced severe deterioration due to a lack of maintenance, the elements, and vandalism. In 2017, CPI hosted a successful Weekend Workshop to clean up and secure the buildings while working with The Interpretive Association of Western Colorado (IAWC) to seek grant funding for rehabilitation of the Walker cabin and Captain Smith’s cabins.